As you may have read, within 2 years after discovering the Park Circle Disc Golf Course, Blaine Kinkel won The Amateur Championship at Bowling Green (with 700+ players, it's considered the Daytona 500 of Disc Golf) and then went on to also win the 2009 United States Amateur Disc Golf Championship. With those 2 titles already won, he then had a rare chance to win the "Triple Crown of Amateur Disc Golf". 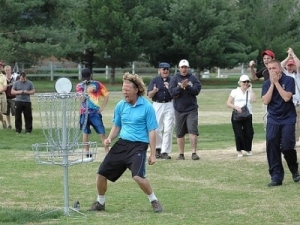 All he had left to do was win the Amateur division at the Disc Golf World Championships. It is a feat nobody has ever achieved before. Blaine did not quite achieve this lofty goal, but he came closer than anyone ever has in the history of the sport. He did, however, land a sponsorship with Discraft - a leading manufacturer of disc golf equipment. Fortunately, because his sponsorship does not include cash, his amateur status has not been affected. If he decides to go pro (and accept cash prizes for finishing high in tournaments), he will not be able to defend his amateur championships in 2010. Although he first learned to play disc golf in Colorado while in college, his buddies in the Charleston Disc Golf Club would like to take credit for his great success in our sport. We can't, of course, but we did hold a tournament at Park Circle Disc Golf Course with all the proceeds going to help him make it to the United States Amateur Championship. He kept up his end of this deal by actually winning the tournament, leading it from wire to wire! Not only that, but he came very close to doing something that many disc golfers had considered to be virtually impossible - winning the Amateur Disc Golf Triple Crown. As fast as the sport of disc golf is now growing, it may become improbable to ever win 2 of the 3 legs as Blaine did. If you see Blaine playing a round at Park Circle, please wish him Good Luck at his goal of defending both of his 2 major amateur disc golf titles! UPDATE: At the urging of many, Blaine decided to Go Pro! So, just wish him Good Luck to win a Pile of Cash! Watch him make a difficult Birdie look easy in short video below. Blaine Kinkel's bid to win all three major amateur disc golf titles in the same year came up a little short in the recent Amateur Disc Golf World Championships held in Kansas City, Mo. Kinkel missed making the cut for the final nine holes and tied for sixth overall. Matt Keats of Charlotte won the overall title by six strokes, shooting 393 over eight rounds of competition. Kinkel, a 27-year-old North Charleston resident who already had won the Bowling Green Amateur and U.S. Amateur Nationals, finished his seven-round marathon at 24-under 374. "I was at the top the whole tournament and made the semifinal cut," said Kinkel, who is manager of the water treatment plant at Bushy Park Industrial Site. "I missed the final nine by a stroke. It's kinda disappointing. Unfortunately, I saved my worst round for my last round. I was a little tense and feeling a little pressure. It was a great experience and a lot of fun." Milford, MI - Blaine Kinkel of Charleston, SC is having an extraordinary year. He won the Bowling Green Ams in April, and has now become the US Amateur Disc Golf Champion with a one-throw victory on the Toboggan Championship course against a full field of pre-qualified players. Kinkel is also the only Am player to have ever been offered a Discraft sponsorship deal before winning this prestigious event. The Charleston, SC player led from start to finish as he took the 2nd of the trifecta that was his 2009 disc golfing goal: to win Bowling Green, AmNats and Worlds. "This has been without a doubt the finest tournament I've ever attended," he said after receiving cheers from the crowd for his victory. "This amazing course, the players and staff. We amateur players aren't used to being catered to, and this is really special." Kinkel led the event from start to finish, but nearly gave it away in Sunday's round three when he finished two over par and 9 shots more than his previous round. He entered round three with a three shot advantage, and was unaware that Brad Frase was busy shooting a -7 from the second card. Frase finished one stroke away from the leader to take 2nd.